Fatima Al Qadiri's highly anticipated and awesome debut LP, 'Asiatisch' finds a natural home in the once again ascendant Hyperdub catalogue. Since 2011, the Senegal-born visual artist and composer has consistently wowed with her unique art and practice weaving memories of a childhood spent in Kuwait with a taste for hyper-local styles such as East London Sino-Grime, Chicago Footwork, Kurdish Dabke and Egyptian Rai, coupled with the kind of forward, vaporous and illusive sonics of up-to-the-second, rhizomic styles such as Seapunk and the micro-genres covered in online hub, DiS magazine. Previous records have touched on sacred Arabic music and she's also collaborated with Visionist, beside her role in the hotly-tipped Future Brown group. Which brings us to 'Asiatisch', her most substantial and arguably definitive statement to date. Very much a product of its epoch, the album seeks rich inspiration from China, both melodically, lyrically and in the way it favours ultra-synthetic colours and timbres more than anything else. It's hardly a cynical move, expecting fame in The East, but shares more in common with the way Jammer, Rapid, or Wonder were possibly inspired to make exotic, escapist Sino-Grime riddims in the early '00s by the looming economic beacon of the HSBC tower on Canary Wharf - a major symbol for the perceived economic allure, mystery, and technologically advanced culture of Asia spied from their relative "ghetto" in Bow, E3. 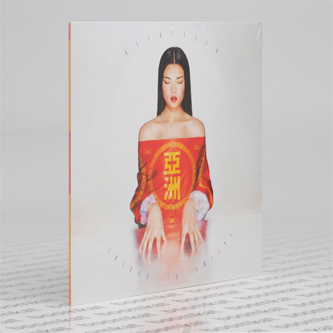 There's a strong, literal vocal presence across the record, from the knowing, computerised Mandarin of Helen Fung on opener 'Shanzai' (trans: "Imitation" or "pirated goods"), thru the wistful phrasing of 'Szechuan' and the curious 'Forbidden City', to a shockingly affective cover of Prince and The Family's 'Nothing Compares 2 U', but also more subtly in the myriad synthesiser chorales which perfuse the glinting, syncopated steel, glass and plastic contours of each track. For us at least, it's gonna be up there with the best albums of 2014, but we can easily see its strange, enigmatic charms spilling across everyones listening lives.